Some titles capture the book’s contents well. This is one of them, as the whole murder mystery revolves around being an English gentleman in 1924. This paradox is dramatized by the murder of a gentleman at the Britannia Club in London. Each club member, a war veteran by requirement, is revealed over the pages to be a seething bundle of paradoxes and contradictions behind his gentlemanly facade. Each member also is presented as a suspect in what first appears to be a locked-room-puzzle-type mystery. All we know for sure is who didn’t do it—Eric. Through his eyes we see the others stripped down, and through his logic and legwork the puzzle pieces are uncovered and reassembled. Meanwhile, Eric suffers from his own internal conflicts. An English-Chinese cross who grew up in India, he’s a British citizen but treated like an outsider. He’s only in the Britannia Club because one of his ancestors founded it, and each male in the lineage has since belonged. He’s the end of the family line, and his investigations jeopardize his membership. But like the other members, he fulfills the veteran requirement, having served in the trenches of World War I. The veterans’ brotherhood forms a bond that nobody wants to break. The stiff-lipped gentlemen of the Britannia Club are nonetheless capable of great passion and heroism. 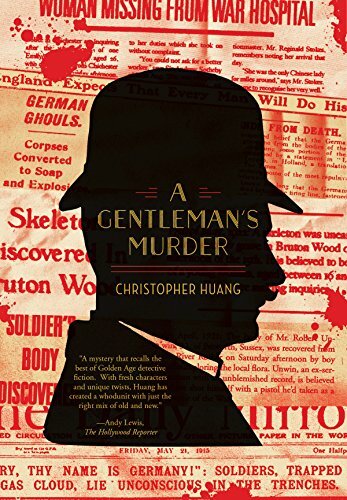 The cause of the murder goes back to and even before the war, and involves women, and secrets, and shame—with more murders committed to cover up unsavory truths. All the characters’ pasts intersect at the Britannia Club, where long-simmering issues boil over. Eric is perhaps the worst person to stick his nose into the situation. His Chinese heritage makes him a victim of the English culture’s embedded prejudice. The author handles this well, presenting the social mores through showing rather than telling. He reminds us through story that the bigotry of earlier eras hasn’t changed very much. Well, yep—that’s exactly what the author has done. And it works because Eric is an Everyman character up against age-old antagonists. His story could be set most anywhere in most any time where a civilization has class layers and mixed ethnicities and subcultures. In A Gentleman’s Murder, we have gentlemen murdering gentleman (and ladies) in a war-exhausted England trying to rebuild itself into something new. Today’s readers who know what happened 20 years later (World War II) might shudder at the naïveté of that statement. But it sets the stage for the paradoxical elements of this novel, which shows people in transition from war to peace, both externally and internally, and how some come through crises and move forward, while others collapse under the strain.